Behavioural economics teaches us that humans naturally place excessive significance on certain numbers. This week, the fact that the FTSE 100 index broke through 7000 for the first time ever made the National News. Companies set prices to certain levels to make us feel better about our purchasing decisions – £9.99 feels much cheaper than £10. Back in 1954 the whole World was captivated when Roger Bannister ran the first ever sub 4 minute mile. The psychologists describe this unwarranted emphasis on arbitrary values as ‘anchoring’. As humans we can’t seem to avoid these mental anchors and they are often used against us in advertising. 1 hour and 1 second! 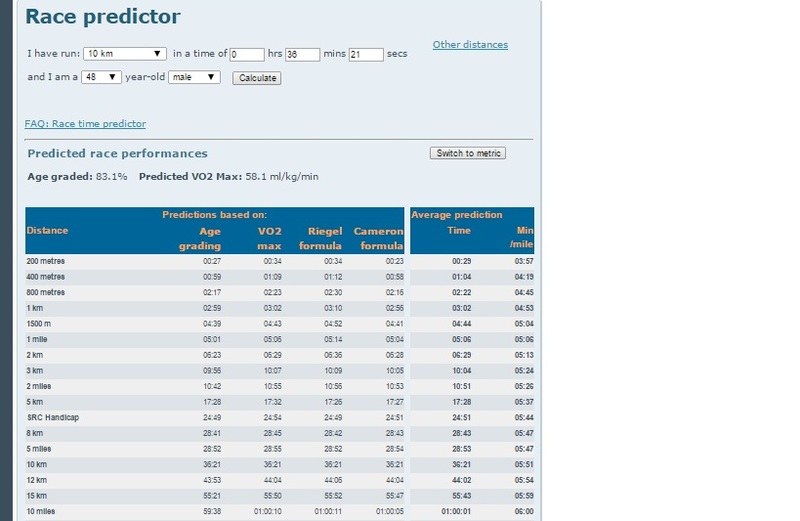 When I saw that, I instantly made my 2015 target to be a sub 1 hour run for 10 miles. I missed it by nearly two minutes at Snake Lane a month ago. However, that was on a very windy day and on a slightly undulating course. 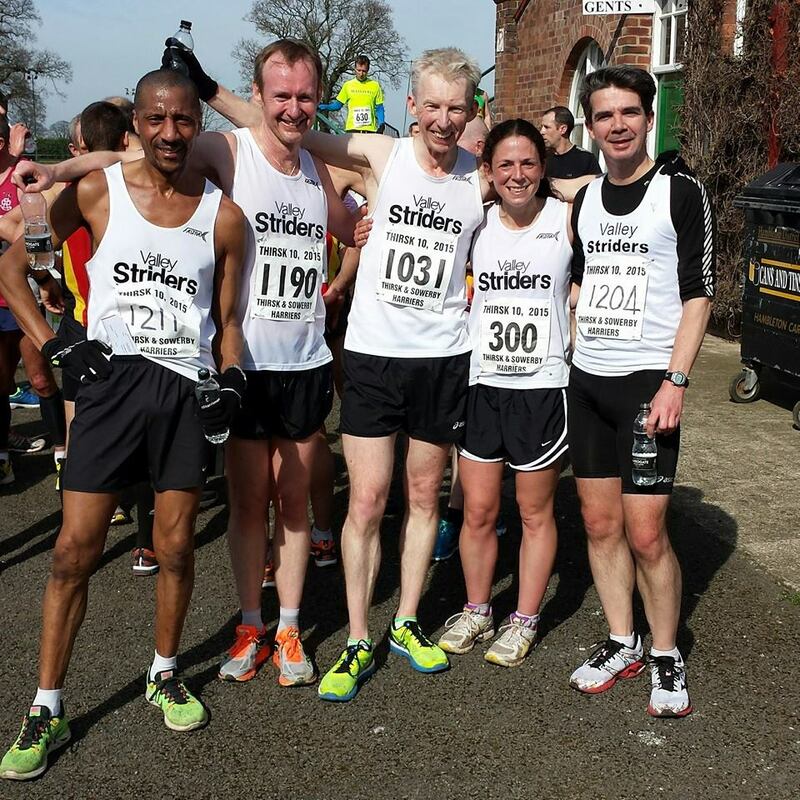 I was delighted when I realised that it was a beautiful early spring day for the Thirsk 10 today – a flat fast course, with only a light breeze and a temperature of around 10 degrees. If I didn’t do it today, I probably never would. Having had an easier week for mileage, I decided to go to York parkrun on Saturday to see if I could run a fast parkrun. I enjoy a pipe-cleaning run before a big race. The course there is very flat, but unfortunately there was a rare old Northerly blowing and as soon as I arrived I realised that there wouldn’t be any fast times. The course is one and a half laps of the Knavesmire, and the Northerly meant there would be two miles into the wind, with only about a mile of a tailwind. For the Thirsk 10, I prepared myself by investing £2.98 at Morrisons in a fresh carton of Organic Beetroot juice (a serious investment for a fundamentalist Yorkshireman – where do they get those prices?) and wore my newish Asiscs 33 Gel shoes – not quite pure racing flats, but very light and definitely more of a racing shoe than a trainer. There were quite a few of my Strider team-mates in the field and we had a good chat before being walked over to the start. I knew that to have any chance of achieving my goal, I had to execute a very good race. 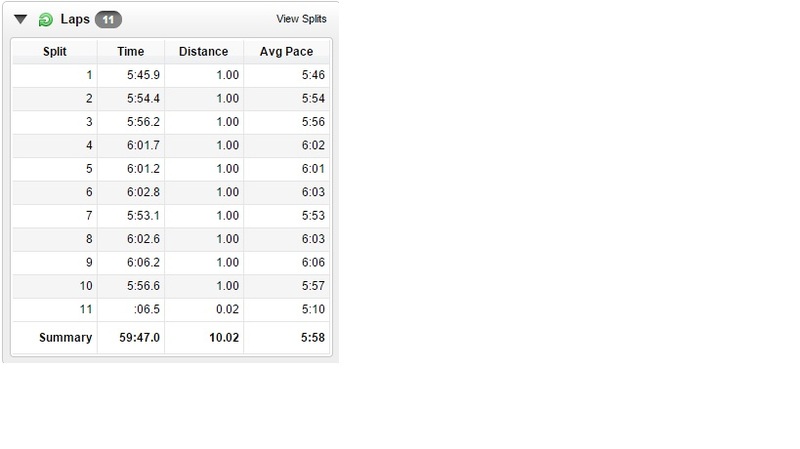 Sub 60 was right at the edge of my capability, so I couldn’t afford any pacing mistakes. I made sure I was near the front row of the starting pack. Luckily, I was on a going day. The first few miles felt comfortable and I ran them in 5:46, 5:54 and 5:56. My head voice started to nag me – “You are going too fast, you idiot, don’t blow it!”. I listened to him for a change and just eased off slightly. Thankfully, I was in a good bunch of about 6 or 7, all of whom were no doubt aiming for a similar time to me. Rather than pushing the pace, I dropped to the back of the group to take maximum shelter. “Let them take the wind, do your running in the last two miles” I said to myself. A bit selfish maybe, but I was going to need all the help I could muster. I got to half way in 29:40 and passed 10K in just under 37 minutes – still nicely on target. At 6.5 miles the course went up a side road for a mile, with a turnaround to come back down the same road. My group was fracturing with a few falling off the pace, so I got behind the strongest lad in the bunch and told myself to just follow him for as long as possible. 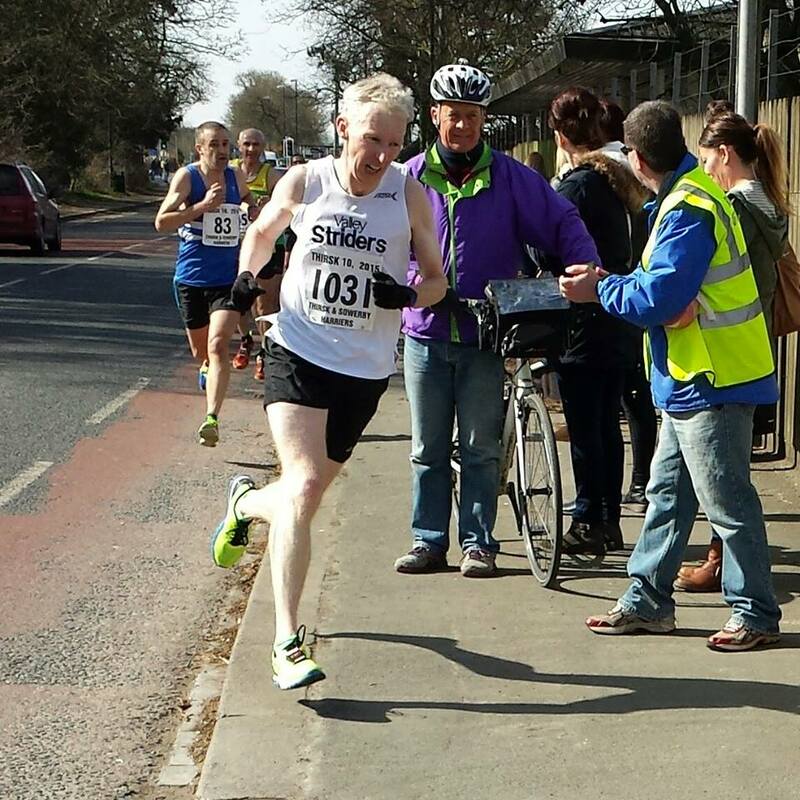 The leader passed us coming back down the road – he was miles clear of second – I later found out he was Jonathan Taylor of Morpeth and he ran 48:45 – a brilliant time – the guy in second ran 52:21. As I took the turnaround I was really feeling the pace, there was just over 2 miles to go and my mind went back to last year when Tom Williams caught me and we had a rare old battle to the finish (he won!). That was really painful and I knew I was in for some suffering again. I’m a firm believer that moments like this in a race are a simple test of how much you want it, how much you are prepared to hurt yourself. I tried to turn my inner voice positive – “You are going to do this”, “You deserve this”, “You will not give in” and other similar assertions. At 9 miles I realised I had to run a 6:15 final mile or better – that should be doable, but man I was firmly in the hurt locker. “Come on you lazy sod, do not ruin this now!”. 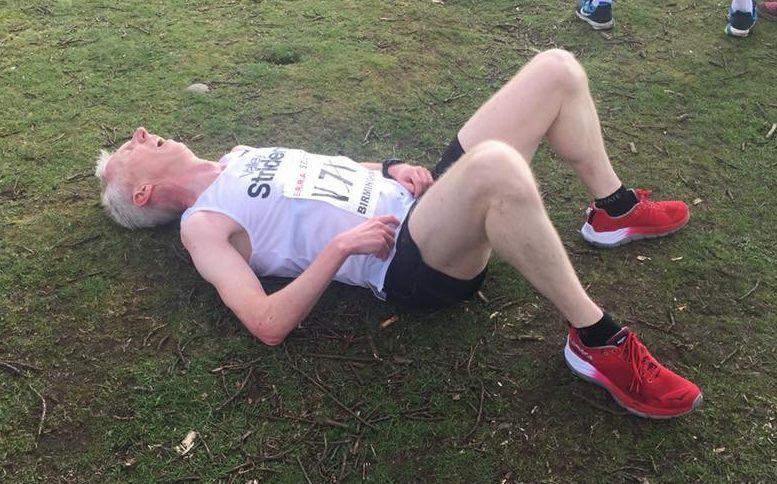 I saw the welcome sight of the racecourse stands and I could see the final left turn up ahead as my watch registered 59 minutes – I can run that bit in under a minute – can’t I? It was head down and fire the burners time and I crossed the finish line in a gun time of 59:50 – 59:46 on my watch – Thank God for that! Cue a full foster collapse onto the tarmac apron of the racecourse and a few minutes of gasping until the breathing and heart rate came back to Earth! As a lovely bonus after the race, my team-mate Jerry wrote that I had won a trophy for finishing third MV45 in the Yorkshire Vets Championships. I’m not certain if that’s right as I appear to be 5th in the results, but maybe some of those above me were not eligible, who knows. I really need to turn my mind onto Comrades now, which is just ten weeks away. I’m hoping for a big mileage week next week, then an ease down into Manchester. I’m running the Salford 10K on Good Friday and as that is another fast course, I will give that a go. However, I probably should slow down a bit a start running longer, and start running more hills.